I am a huge advocate of the women in computer science movement. I am also a huge fan of the Computer Science (CS) field in general and, despite my number of years in this industry, I continue to be amazed at the volume and speed by which new technology is coming at us. Yet, with all that’s going on out there, it is still incredibly hard to find talented developers and designers. So, while I want to see more young girls learning to code and women in professional technical roles, quite frankly I just want to see more people who code. First, there was the scuttlebutt around the “Male Allies” panel at the Grace Hopper Conference a couple of weeks ago. Everyone was so wound up about the gaffes of the three men on the panel that we lost sight of their key messages which were to support gender balance and eliminate wage gaps in tech across all levels of a company. How are we going to make progress for women and minorities in tech if we attack the majority when they aim to support the movement? When will meritocracy prevail over gender? My friend Jocelyn Goldfein has a lot of good thoughts on this topic here. We need to bring men into this conversation without them worrying about being attacked for speaking up and we need to focus on how to build great careers in CS for everyone – not just women. Second, I have been thinking a lot lately about the preponderance of women and girls’ organizations that are encouraging and supporting women to code and choose technical careers. It’s wonderful that there are SO many of these organizations out there, yet it is so hard for girls and women to know which ones are the best to meet their particular needs and/or interests. I am concerned by how many of them position themselves competitively against each other vs. combining forces to form a stronger, united, movement. A founder of one of these organizations told me recently that when she approached a nearby, similar, group to collaborate she was met with “hostile resistance”. Also, that some of the members of her organization did not want to be part of meta-organizations because it drew too much “adverse attention” to their roles – akin to the extreme circumstances of #gamergate where women are fearful for their lives because of their chosen profession. Certainly there are varying views on how best to encourage girls and women to code, but imagine how powerful these groups would be if they combined efforts instead of competing with each other or fearing retribution (or worse) for participating. Perhaps the mere size of these groups would deter those who attack them today or maybe, even, convince their attackers to support vs. challenge their mission. Finally, I was recently enlightened by my friends at the MassTLC Education Foundation on the rather pathetic state of our k-12 CS programs in Massachusetts. I view CS as basic literacy in the 21st century, yet in most public and private schools it is treated like an elective, not a core math or science requirement. In 2012, only 1000 students in Massachusetts took AP CS and 559 passed; of those who passed, only 24 were underrepresented minorities and 89 were female. 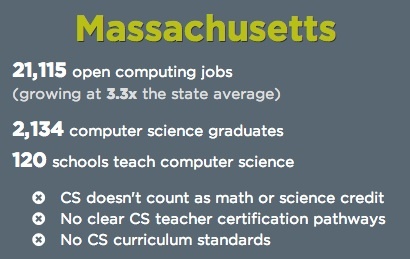 There are also no standards or licensure for teachers who teach CS in k-12. According to this NPR story, only an estimated 10% of k-12 schools in our country teach computer science. This interactive data chart shows the steady decline of CS majors in the US. With all the money out there to invest in new technology and innovation, we are not making the same level of investment in the people we need to make these innovations a reality and sustainable into the future. From the past we have learned that big issues such as the civil rights and feminist movements took large groups of likeminded people to go from controversy to significant policy and cultural changes. We take for granted that women can vote in the US and in many, but not all, other countries around the world and we tend to forget that not too many years ago, schools and busses were segregated. Today, we are fighting for equal pay and career opportunities for women and there is controversy about how few women there are studying CS, but there is a bigger issue to solve. If Venture Capitalists and technology industry leaders want to support these movements, we need to do more than just attend conferences and speak on panels. We need to change policy – like eliminating noncompetes in MA to allow talent to move where their passions take them instead of feeling trapped in their jobs or eager to depart from the field of technology altogether. We need to band together instead of standing on hundreds of different platforms to solve a greater issue. We need to fund programs for young people – not just girls – that foster interest in creativity and technology. We need to enlighten high school kids about the opportunities in technology and be available to mentor these kids when they go to college. We need people who code. Do you agree that we need to do more to encourage young people to code? Join me the week of December 8-14 for CS Ed Week where the MassTLC Education Foundation will be championing Hour of Code in cities and schools across all of Massachusetts. This national program is designed to inspire students to learn more, dream more and be more through Computer Science. 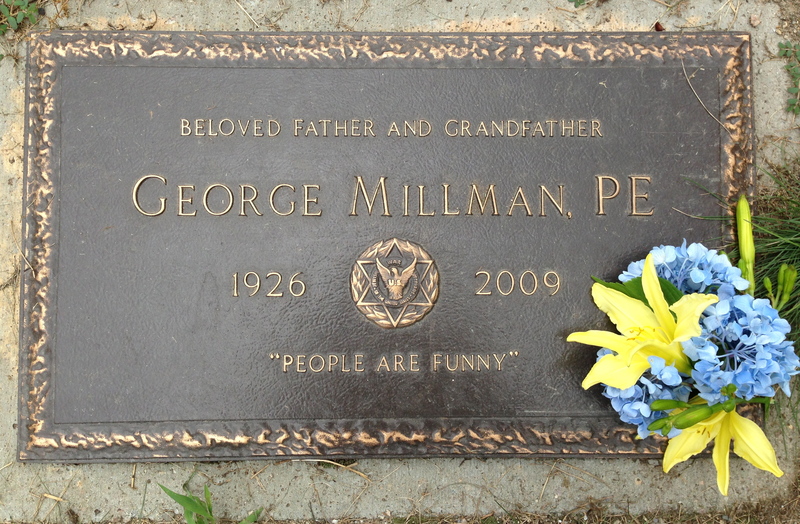 One of my favorite and rather famous family quotes from my Dad, is “People are funny” [see his epitaph, inset]. It was his catch-all phrase for when someone did or said something odd. The saying was his way of recognizing that we can’t always explain why people do or say what they do, we just have to either learn from them or have compassion for them. Sometimes, though, I want to do more than just learn or have compassion. I want to respond with a “hey, what are you doing?” or “you can’t say that!”. Yesterday was one of those days. When someone said something that I brushed off in my head as “people are funny”, but the next morning it still nags. Because I’m in the wonderful world of entrepreneurship and tech, I have the common experience of working closely with men. A man has been my boss in just about every job I’ve had. Men have been the majority of the employees I have hired and managed and, as I have grown professionally, more often these men are my peers. I travel with these men, go out to coffee, lunch, drinks, and have dinner with these men. Often, I also get to know their wives and have introduced our children. I’ve been to their weddings and have had the honor of staying in their homes when I travel. I have been so fortunate to develop some of the strongest relationships with these men over my career as I have with some of my dearest girlfriends. They’ve been my mentors and confidants and often ask the same of me – which I do with pleasure. Despite all of this, it seems that no matter what my rank and status or theirs, there is always someone who assumes that my strong rapport with these wonderful men must mean there’s more to our relationship. Good working relationships at work are often like second marriages. We’ve all heard the expression “my work husband” which suggests that this other guy in your life who knows you inside and out is your go-to guy at work, but it’s strictly a professional relationship. These are the guys we have friendly banter with, we share inside jokes and we are able to finish each other’s sentences. We’re BFFs in the best sense of the word. Yet, someone always opens that door that questions how a relationship like this is possible without something more going on. It’s the proverbial “a man and woman can’t possibly JUST be friends“. Now back to yesterday. While in a meeting that was (ironically) about raising awareness of gender bias in venture capital, I was asked if my male colleague in the meeting with me was both my “work and my life partner”. I do not believe there was anything this man or I said or did that would infer such a thing. We clearly know each other well and had a few occasions of poking fun at each other that demonstrated a good working relationship, but it wasn’t flirty or unprofessional. So, what provoked this question? Do men and women have to be all business to be taken seriously as professional colleagues? Should my colleague and I be more impersonal in meetings? Can men and women NOT just be friends? When we are striving towards more equal and gender neutral work environments, how do we eliminate the assumptions and biases we have about men and women working together? As a society, we need to hold each other accountable for respecting the strong relationships colleagues develop regardless of their gender. If two guys can be BFFs at work, play golf together and travel together without judgement, shouldn’t male and female colleagues be able to do the same? …or, are people just funny?